Ladies and Gentlemen. May I present to you a game that was probably the humble TI99/4A's "Killer App". Or it would have been if more people knew about it. If you like your side scrolling shoot 'em ups, and you like them action packed and with a nice difficulty curve, this one for is you. But it's got a little bit more to it than just shooting, there's strategy in there, and some serious pixel-perfect maneuvering. So, let's begin. 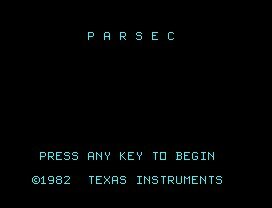 Get past the "no-frills" title screen (It just says "Parsec", basically. In plain mono-spaced text, no less) and we're hurtling across space in our natty little space ship. You can fly around a little, even crash, just get used to the handling, the game doesn't start until you press fire. Once you do, you are warned that alien craft are advancing, and then on they come, swooping down one at a time, easy fodder for your laser cannon at this stage. They don't fire back, just hurtle their craft at you, and when they go off the left side of the screen, they reappear on the right. 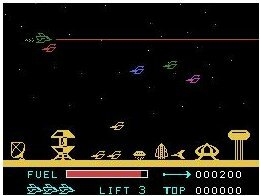 Until they're destroyed, the aliens will fly right to left over and over again, getting faster and faster until they're literally whipping across the screen, making it impossible to hit them. But hit them you must, you have to destroy them all to progress. On the first level, these beasties take one shot to die. On level 2, they take 2. And so on, until level 4, after which they just come faster instead. The next aliens are the Urbites, a craft that fires back at you, and for the first couple of seconds they are invincible. They're quite slow, though, but will move up and down with you, and advance on you when they're level, so you need to kill them before they get too close for you to avoid their shots. Another wave of aliens (This time it's the "LTFs" that attack you), and then you must face the Dramites. They look just like the Urbites, except they move really fast, fire really fast, and unless you keep on your toes, they'll have you. Next come more aliens, this time it's the UFOs. The UFOs are sneaky, and attack from behind. Will they come high or low? You don't know until the first one comes out, and you really need to hit them first time to maximise your chances of survival. A tricky wave indeed. Next are the Bynites. They are like Urbites and Dramites, but advance towards you all the time, firing their cluster-like missiles at you. From level two onwards, they have an extra trick up their sleeve, after the first hit they turn invisible until you destroy them. 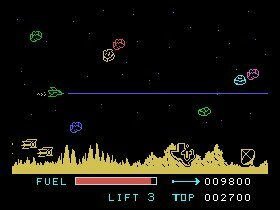 Finally, you face an Asteroid belt, and must destroy a certain number of rocks to begin the next level, where we start all over again. But that's not the end of it! Not by any stretch of the imagination. 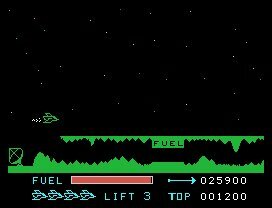 You see, you only have a finite amount of fuel, and you must refuel by means of refuelling tunnels that appear whenever your fuel is low. These come in three varieties, the easy short one, the medium not too bad one, and the one that's about 2 minutes long with loads of jagged bits. 2 minutes of pixel perfect maneuvering... that takes it out of you. Thankfully, you do have 3 speeds of movement. Known as "Lifts", Lift 1 is the one you'll use for the refuelling tunnels. Lift 2 is medium speed (I never used this, EVER) and Lift 3 is full speed, what you'll be using for the majority of the game. From level 4 onwards, you begin to get surprise attacks by "Killer Satellites". These little meanies appear with NO warning (you get a little siren and warning text for all the other alien waves), and start tracking and firing at you straight away. If you're not prepared for it, you can get caught out. Also, your laser can only be fired for so long before it overheats, destroying you. On Level 1, this is about 6 seconds of continuous fire. From about level 10, one tap on the fire button will start your ship flashing, the warning signal for an imminent overheat. There's supposedly 16 levels of fast paced action, and I never saw the end. I did have one mammoth session once, reaching level 12, but the combination of speed, laser use restrictions, and general difficulty was too much for me in my tender years. Maybe now I could complete the game, but I would have to get used to those hideous joysticks again... On the other hand, I could use the keyboard, or even the wonders of emulation, but it wouldn't be the same. I developed a symptom we called "Parsec Leg", which always occurred when the Dramites attacked... the sudden action to avoid their speedy attacks resulted in me involuntarily raising one of my legs in the joystick-twisting frenzy. My family laughed, but I was quite traumatised by it! I'm considering setting up a charity fund for anyone else who was affected by it. I can see the TV adverts now... I just need to sign Michael Winner over to present it. 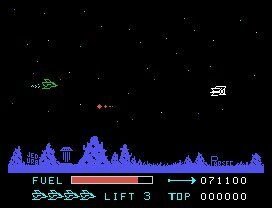 But I don't care, I'm going to remember Parsec for the quality game it was, and so should the Retro world. It was an arcade-quality game playable at home. That's difficult to achieve in the modern era of gaming! Did you ever use a speech synthesizer with Parsec? It warned you of oncoming aliens with speech as well, fuel tunnels and even gave some positive feedback.